This is a great resource for the biblical counselor and those who are involved in a relationship whether engaged or about to be engaged. Like other booklet in this series, this work doesn’t disappoint; it’s beautiful to see a work that has brevity, communicate simply and biblically while being tremendously helpful. The author David Powlison is a wonderful biblical counselor who in this work asks a lot of great questions for those who are thinking about marriage. While the subtitle of the book is “5 questions to Ask Yourselves,” really it’s a booklet of many questions (I lost track of how many), all of which are under five larger and more general questions. I appreciate the author’s use of questions which makes it an ideal book to warm up discussions between couples and also offer something the Nouthetic counselor to work with. It’s not just the questions that are good but also some of the practical tidbits the author gives. For instance, I really appreciated the author’s point of answering the question of whom to look for counsel concerning the relationship and the decision of marriage. Specifically, after saying that one should invite parental insight he acknowledges that strained parental-child relationship exists but that this should be a great opportunity “to seek to heal the breach,” something that is helpful in tying up loose ends of the past before going into a new marriage with unresolved baggage (26). I started reading this book as a Pastor looking for good materials to go over with those who we are going over pre-marital counseling with and I not only recommend it, I am going to be using it. This is a classic political economical work that I finally got around to reading. What made the book interesting even before I read the work is the story of its author, Friedrich von Hayek. Hayek was at one time a prominent academic defender of socialism in his home country who later became an outspoken critic against socialism, communism and fascism. An Austrian who experienced firsthand the rise of socialism and fascism in his own country, this book has a prophetic tone directed towards its English readers. Hayek wrote this book from 1940 to 1943 during the height of World War Two to warn the English against adopting the same ideologies of the fascists they were fighting against; apparently fascists ideas have made inroads among some British elites. Interestingly enough, the book’s prophetic flavor remains relevant today with its warning against statist economic policies. Many things could be said about the content of this book. A lengthy review would be impractical so what follows are some of the highlights. One thing I appreciated from the book is Hayek’s discussion of planned economies. “Planned economies” is truly a misnomer. Hayek makes it clear that he’s not against planned economies per se, for instance in the case of individuals making rational economic decisions for themselves; rather he is against the type of planned economies made by the government that comes with force from the rule of law. His chapter on the relationship of planned economies and totalitarianism tells us one chief reason why government planned economies is bad. I also appreciated the book’s discussion of Nazism’s socialistic roots which challenges the modern myths today that the Nazis were truly conservatives and right wingers in their values. Readers who want to see the arguments further developed that the Nazis were socialists and left-leaning should consult the book Liberal Fascism, a wonderful work I read simultaneously with this book. I also enjoyed Hayek’s last chapter which dealt with the suggestion offered by some that a global controlled economies is a great economic goal but Hayek argues that if planned economies can’t take off at the level of the state what makes one think it will work at a larger scale? It will only make matters worst. Great book! NOTE: We have written on the topic of “Strange Fire,” specifically the problems of Charismatic and Pentecostal Theology in the Asian context here on the blog in the past and will continue to do so from time to time in the future. 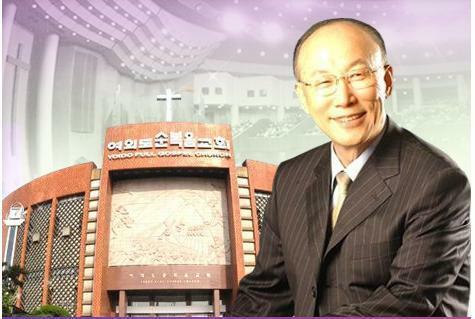 “Pastor” David Yonggi Cho is the founding pastor of the Yoido Full Gospel Church in the Assembly of God denomination and reputed as the world’s largest congregation. There are concerns about his theology being biblical since he’s an advocate of Word of Faith teaching, among other things. According to reports, Cho was identified as an accomplice through committing breach of trust in 2002 by ordering the church to purchase his elder son Hee-jun’s stocks at four times the market price. The transaction resulted in the church’s loss of 13 billion won (US$12 million). Moreover, Cho was also found guilty of tax evasion of 3.5 billion won (US$3.3 million). In the same ruling, Cho’s elder son Hee-jun, the former CEO of the church-affiliated local daily Kookmin Ilbo, was sentenced to three years in prison for colluding with his father in the embezzlement scheme. Over at Charisma News, there’s even a piece titled Setting the Record Straight on David Yonggi Cho by a friend of his ministry for forty years that provides some more context, making the point that Pastor Cho was misled by his “prodigal” son. I think it’s worth reading to see this situation as charitable as possible. 1.) Church buying stocks? I think the church’s shouldn’t have it’s business in stocks in the first place. One can see how a church driven by a prosperity message would be tempted to live out their pastor’s teaching and moves the church and the pastor stepping towards the direction of this scandal. Biblically speaking, “Pastor” Cho isn’t qualified to be a pastor; or if he was qualified he has disqualified himself beforehand. I imagine it’s very hard to remove a charismatic, “successful” pastor on pragmatic grounds no matter what theological stripes you come from, but it must be even more difficult among Charistmatic circles with their ecclesiological baggage of a man of God being “anointed,” having special insights, revelation, etc., that gives more immunity than it is healthy. 3.) The Charisma News piece also mentioned that this “prodigal” son approached the dad with his dad’s choice elders to sign the paper work that got him in the quagmire. It’s important to avoid appearance of evil–and that means family business and church funds shouldn’t mix in the first place. 4.) One can’t help but to wonder about the role of prosperity Gospel in all this. In Cho’s book, Prayer that Brings Revival, he wrote “The gifts of the Holy Spirit are available for the asking. Healing, deliverance, prosperity, and blessing are all to be asked for” (75). With an unbiblical understanding of church leadership coupled with a wealthy church, a bad ecclesiology, and a prosperity gospel, you’re ASKING for this scandal. A cleaning woman in southern Italy has unwittingly thrown away contemporary artworks that were supposed to be part of an exhibition. Lorenzo Roca, head of the cleaning company, said the woman “was just doing her job” when she thought two artworks were part of trash left behind by those setting up for the show that opened Wednesday in Bari. Show organizers said one of the works she gave to a city sanitation crew before dawn included pieces of cookies, which were scattered on the floor, as part of an artistic arrangement. Roca said the cleaning company would use its insurance coverage to pay for the trashed art works, whose value was estimated at 10,000 euros ($13,700). $13,700 for some cookies in the trash? Is it really worth that much money in damages? What was the art exhibit about anyways? So I got curious and tried to do a little research. I learned that the “pieces” thrown out was part of a larger complex display set up at the expansive hall of Sala Murat gallery in Bari, Italy. The incident took place last week on February 19th, 2014, apparently the night before it was open to the public. The display object provides dynamic surfaces accommodating new modes of presentation, relations between exhibited artwork and spatial conditions. 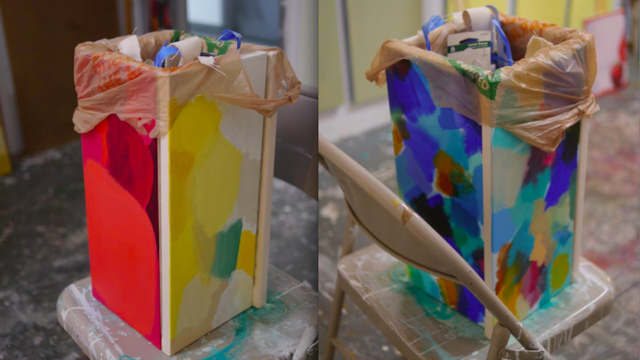 Participants include, artists, writers, and curators whose works are formally incorporated within the display landscape as a unified installation, blurring the boundaries of their practice. We are interested in the unpredictability of the narratives that arise from this type of organization specifically in the way individual artworks are mediated through the formal display. There is definite anticipation for tension and dialogue throughout the process of production, display and setup of the works. These are the moments that we hope to elaborate through discourse and writing around the notion of display; touching upon issues of proximity, adjacency, space, form and objecthood as it evolves from reflections and development of this project. It’s funny to see artists talk about tensions, dialogues and discourse and the theme of pushing the envelopment when it comes to space, conventions and interpretation. It’s all cute and cool–until stubborn reality smacks hard against their post-modern sensibilities. 1.) It might be impolite to say at a Museum but since contemporary Post-Modern art is so bad, can you really blame the janitor’s mistake of art pieces for trash? 2.) For those who think art is totally subjective (note that I’m not denying that there’s no subjective elements in analyzing art) the saying “Beauty is in the eye of the beholder” has another corollary, “so is trashy art in the eye of the cleaner,” though it’s taken quite literally in this context. 3.) Related to the first two point, if “art” is crafted as an “anti-art” and presented in such a way that the reality of it as an artistic presentation is being blurred can you really blame anyone for not recognizing it as art? 4.) If the project as a whole sees virtue in making viewers question the narrative of formally displaying art and your art pieces get thrown out accidentally by a well-intention cleaning lady before the pieces were “installed” (FLIP’s own words), doesn’t that pull the rug underneath their very own project and aim? 5.) Given the artists’ own words that “We are interested in the unpredictability of the narratives that arise from this type of organization specifically in the way individual artworks are mediated through the formal display,” they got what they asked for. 6.) On the one hand we already saw the quote from FLIP that “There is definite anticipation for tension and dialogue throughout the process of production, display and setup of the works.” Yet on the other hand, “What has become shocking to us, in light of this event, is the scale of media attention it has attracted and added exaggerations around this incident.” There is the tension that they claim they anticipate tension concerning the process of art with it’s feedback while later being “shocked” at what happened to their art display and the feedback. 7.) The cleaning lady unwittingly has become like the boy who cries out that the Emperor has no clothes: she exposes the insanity behind contemporary art’s love affair of post-modernity and anti-art “art.” At root is an issue of worldviews and view of reality, and philosophy of art itself. It is a worldview crisis. 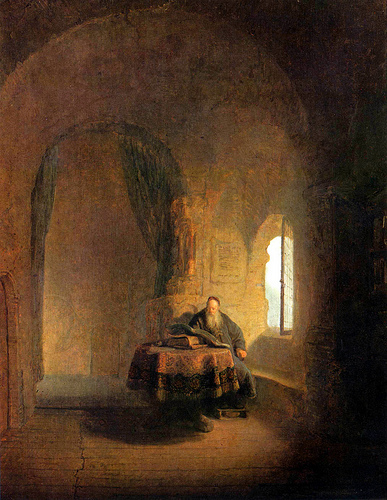 For more on a Christian view of art, see my Review: Art and the Bible: Two Essays by Francis A. Schaeffer. I also highly recommend the work Modern Art and the Death of a Culture Paperback by H. R. Rookmaaker which I read years ago and might read it again in the near future. 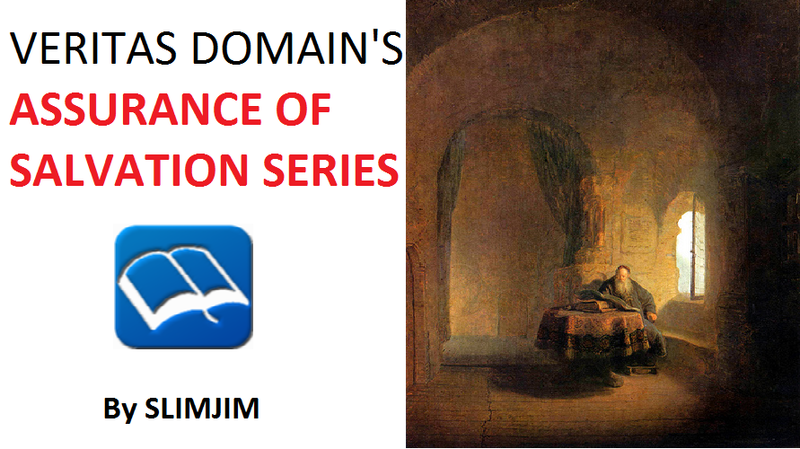 We have completed our weekly series of outlines on the topic of Assurance of Salvation. It was a joy to search the Scriptures and work on this outline that I find helpful to encourage God’s people in counseling to encourage believers to find their assurance of salvation and bear more fruit, joy in Christ, etc. Feel free to share this and use it for God’s Glory along with the encouragement of believers and evangelism of unbelievers! 1.) Assurance of Salvation Part 1: Why study on the topic of Christian assurance? 6.) Assurance of Salvation Part 6: Do you understand the Gospel? Most people misunderstand what fascism really is. The stock response usually has something to do with Hitler and Nazi Germany (which they were). While the Nazis were fascists, it does not follow therefore that fascism is the same thing as Nazism, since Nazi ideology wouldn’t make sense in defining Italian fascism under Mussolini. This book argues the thesis that Left-leaning progressives have a lot more in common with fascism and that what fascism is creeping into the West in the form and imagery of contemporary “liberalism.” This book is part history and part political commentary of today’s politics and makes for a fascinating read. As a result of this book I want to explore the history of Mussolini’s rise to power in Italy, since the book argues that Mussolini was a lot more brighter than we give credit to him today since we see him as nothing more than a mere stooge for Hitler. This book also makes me want to study more deeper the history of the rise of the Nazis since this book explores the question of how exactly did an evil government under Hitler ever achieved the power it had when there were many ordinary citizens in Germany. How Mussolini and Hitler rose to power should be a cautionary tale of today’s rise of power of the Federal Government. The author does a good job arguing that the Left’s caricature of Hitler and Mussolini as far right extremists is not accurate at all but they belong more appropriately with the Left with their socialism and Statism. I also enjoyed the book for its discussion of Fascist economics; the author makes an excellent observation of how government regulation of business paradoxically brings in more business intrusion into government via lobbyists. The explosive growth of lobby industry in Washington D.C. is a good example of that. Can we blame the business if they are out to protect their interests when every regulation for an industry will impact them? The unintended consequence of this is that big businesses in their industry have advantage for these regulations so as to kill smaller competitors with more regulations and need for more employees (and specialists such as lawyers, accountants, etc) to follow through with the regulation. What you end up producing is a fascist-like relationship of government and businesses. The irony of government intruding in business is that it brings every business interests into the affair of politics, either to go against a competitor or defend against a competitor. There are so many other things that are insightful; one just has to read the book instead of a mere review. Purpose: Here is a summary list of questions to Probe the Assurance of your Salvation that we have gone over in this series. If one wishes to probe it more in-depth with Scripture with each questions please consult Part 6-9. 1.) Do you truly understand and trust in the Gospel? 2.) Are you fellowshipping with God and God’s people? 3.) Do you live knowing and practicing the truth? 4.) Do you confess your sins? 5.) Do you follow God’s commandments? 6.) Do you reject loving the world more than God? 7.) Do you love Jesus and others? 8.) Has God changed you? 9.) Is the yoke of obedience lighter for you over the passing of time? 10.) Is God disciplining you?